Scientists strike out for a wall of ice in the far north, where rapidly changing glaciers are being tracked by a project called "Oceans Melting Greenland." Credit: NASA/JPL. View larger image. I looked out the window of NASA’s modified G-III aircraft across the expanse. I knew what I would see. I knew it would look like white pillow-y ripples going on and on and on, way farther than anyone could see, like a vast field of white sand dunes stretching away into the distance. The Oceans Melting Greenland (OMG) aircraft was flying across the entire top half of Greenland from the northwest coast to the northeast coast to make the day’s first science measurements. And the first science flight line was all the way across the Greenland Ice Sheet, across 620 miles (1,000 kilometers) of ice that’s up to 2 miles thick and hundreds of thousands of years old. And although I’d flown in Greenland a bunch of times before, I’d only ever flown over the coastal areas, where glaciers around the ice sheet’s edges carve their way through the Greenland terrain, to cut out deep, narrow fjords over centuries’ time. Everything here is vast and expansive: the size, the views, the enormous quantity of ice. 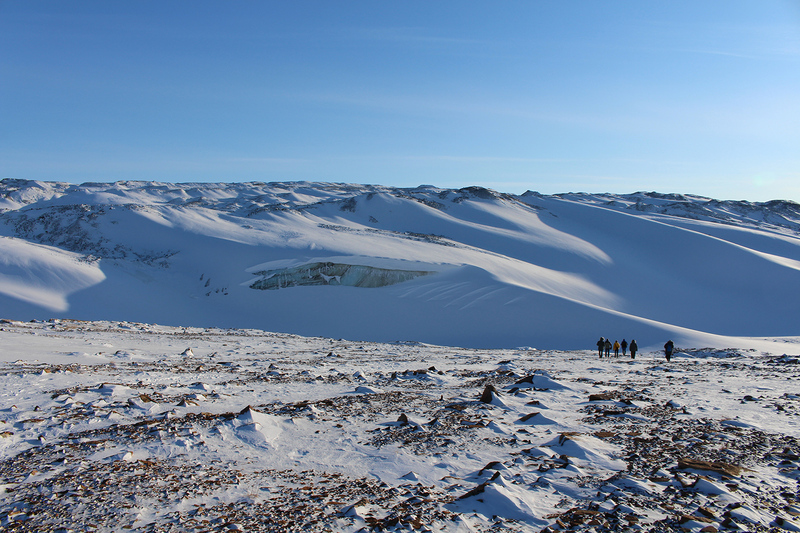 Two days before, I’d trekked up to the ice sheet with a few members of the OMG team. We stood in the insanely cold, dry, biting air (Greenland is one of the least humid areas on planet Earth, with the cleanest, clearest air) and gazed into the incomprehensible distance. It was easy to use a snow boot to scrape the 2 inches or so of fine, dry, powdery snow away from the ice sheet to uncover the hard, greenish blue ice. On the edge of the ice sheet, a slice of ancient ice layers was exposed like a glistening wall, and we’d walked past it on the way up to the top of the sheet. The ice wall was so vertical and so sheer, the snow that hid the other parts of the edge had fallen away, and we could see its smooth surface shining like a gem: striped blue and green. That ice is hundreds of thousands of years old, made from snow that fell year after year after year, eventually becoming compressed and preserved in this cold, dry desert environment. Standing on top of the ice sheet, I imagined it under my feet, going down and down and down for a mile or more. An exposed wall reveals ice that is hundreds of thousands of years old on the edge of the Greenland ice cap. Credit: NASA/JPL. Everything here is vast and expansive: the size, the views, the enormous quantity of ice. Flying over them, the glaciers look like hundreds of broad frozen rivers, each one up to a few miles across, each one channeling its way from the interior of the landmass toward the sea over thousands of years. Each glacier carved out a fjord through the rock and out to sea in the same way a river erodes its channel, except it’s so much bigger, so much slower and the erosional power of the ice is so much more intense. From up here, the glacier’s impossibly slow creep seems frozen in both space and time. But the glaciers are moving. Stress fractures or crevasses, which are easy-to-observe evidence of glacier movement, form as the glaciers slope downhill toward the sea. And of course, we also have scientific measurements. Detailed satellite images show that the terminal edges of many glaciers such as Jakobshavn have receded by as much as 0.4 miles (600 meters) per year in recent times. Scientists also have time-lapse footage of seaward glacier flow. But having evidence of glacier flow, and even glacier recession, is only part of the story. As a warmer atmosphere and a warmer ocean around the coastline continue to melt the massive amount of ice that covers Greenland, the ice ends up flowing into the ocean, which causes sea level rise worldwide. A glacier flows toward a frozen fjord on the Greenland coast, as seen from NASA's modified G-III aircraft. Credit: NASA/JPL. As we flew over, the GLISTIN-A instrument received data from a 12-kilometer swath of whatever is below and off to the sides of it, in this case glaciers. Using these data, we can measure, with great precision, the height of each glacier we fly over. See, when the end of an individual glacier melts and calves into the ocean, the whole glacier speeds up and flows even faster downhill toward the ocean because there’s less friction against the sides and bottom to slow it down. The faster it moves, the more it stretches — like pulled taffy — and when a glacier is all stretched out, its elevation is lower. And because OMG will fly the same science lines along the same coastal glaciers every year for five years in a row, we’ll be able to find out how much elevation each glacier has lost, how fast it’s flowing into the ocean and how much ice has been lost. 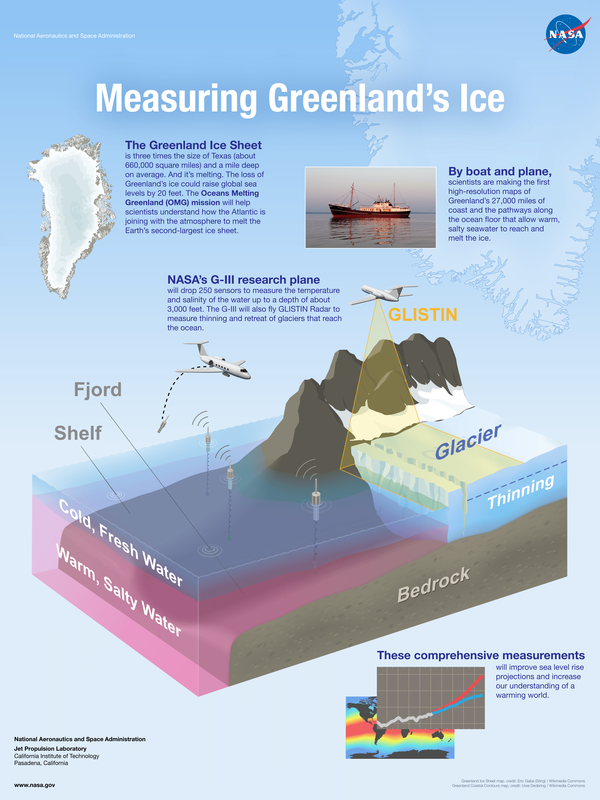 NASA's OMG is monitoring the speed of glaciers around Greenland's coastline. Credit: NASA/JPL. Over my headset, I can hear the pilots discussing the flight path with the instrument engineers. Out the window, I can see Greenland’s northernmost glaciers below us; white upon white upon white. They sure appear stable, still, enduring. But they’re not. They’re melting. And northern Greenland, along with the rest of the higher latitudes in the Northern Hemisphere, is experiencing some of the most intense impacts of global climate change right now, today. Find out more about Oceans Melting Greenland. View and download OMG animations and graphics.